Painting the girder bridges is something I should have done a long time ago, before they were permanently installed. I sprayed them with the grey primer before putting them in position on the viaduct so that was relatively straight forward but brush painting? - yes, it does take some time. It makes it less of a chore when you can see it looks better so in a few days or so I'll do the other half. It might even protect them from the effects of the sun too and stop them becoming too brittle so that'll be a bonus. 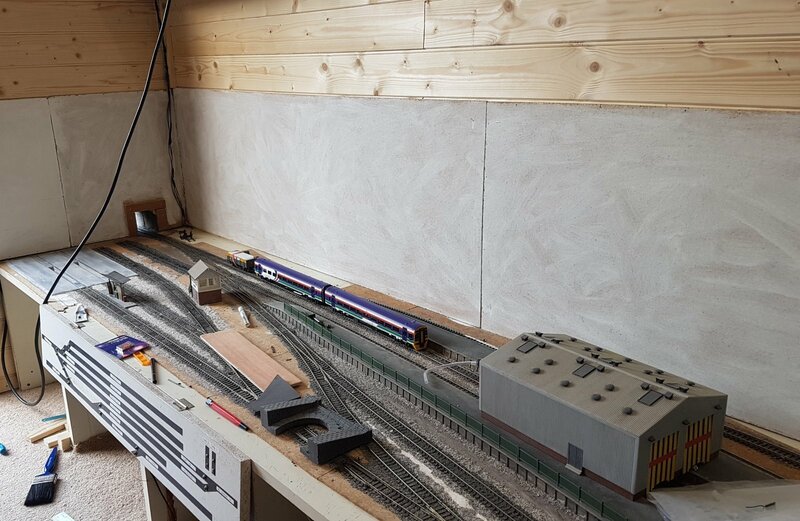 It's strange how doing small tasks like that, and the short length of track ballasting at the entrance to the shed, makes it all seem like a railway again. I've looked at the entrance to the shed with it's bare track numerous times, in fact almost every time I walk down the garden path, and yet now it looks complete, finished almost. All for the sake of a few minutes work with a bit of granite ballast, some varnish and a few drops of white spirit. 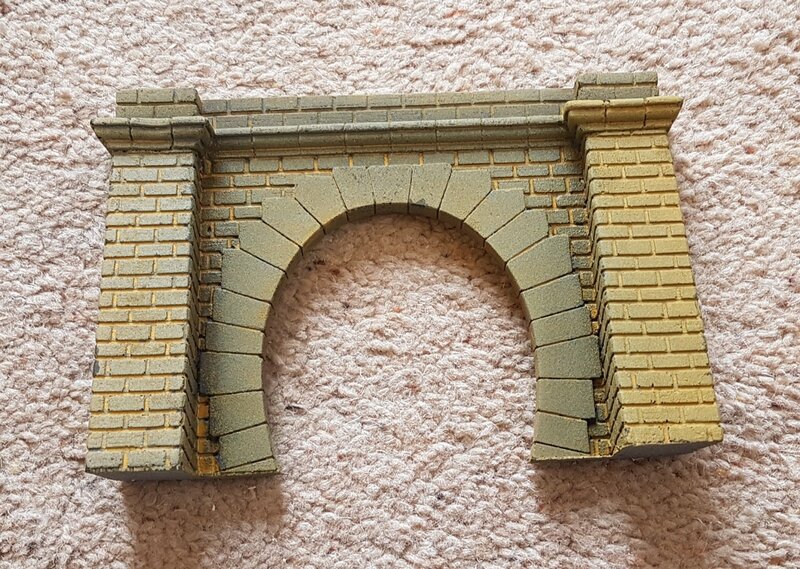 It's certainly not as warm today as it was when I began painting the girder bridges but I've managed to do the other half this afternoon, albeit apart from some minor touching in that's still required. 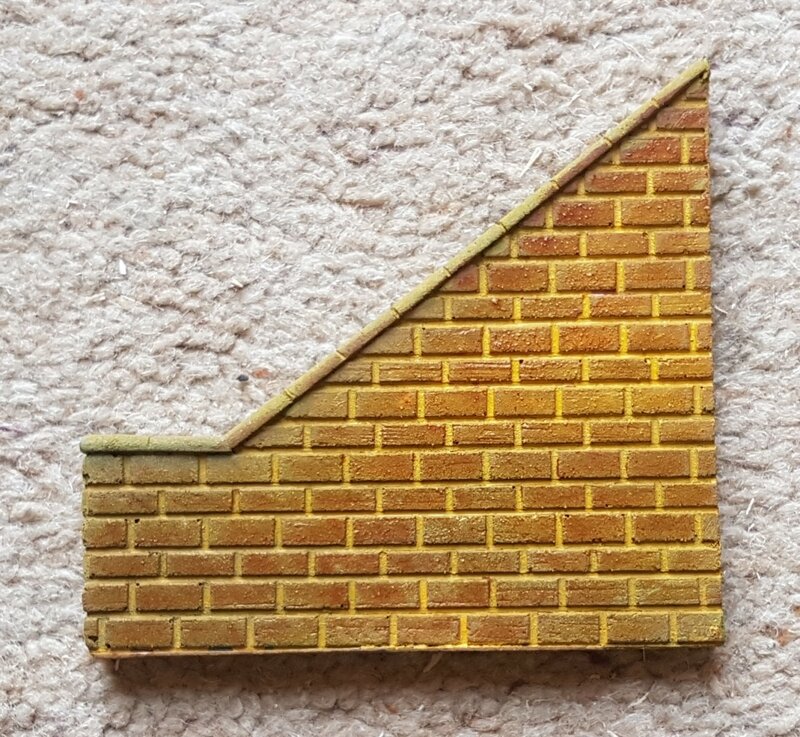 I found it possible to paint behind the walkway railing using a fine paintbrush but it lasts only for a few strokes before the bristles disappear and you're left with something resembling a toothpick. I'll return to it at a later date. I still have to do something with that river bed and I'm longing to make a start on it but I know there's other things to do first so that's another thing that will have to wait for now. My thoughts now need to turn to the indoor section as I'm not really able to put any stock on track until I've decided what I'm doing and got certain things out of the way. Deciding what I'm going to do is a challenge for me but I thought it might become a bit clearer if I made a start by painting the backscene boards. I was scouring our cupboards for some white emulsion but came across a tin of white undercoat. I haven't a clue where that came from as I certainly can't recall buying it so it must be several years old. I prised open the lid and was faced with a layer of dried paint so thick that I thought the whole tinful had solidified. Managing to cut through it I was relieved to find a dirty brown liquid beneath which, after a few minutes stirring, magically turned a pure white. 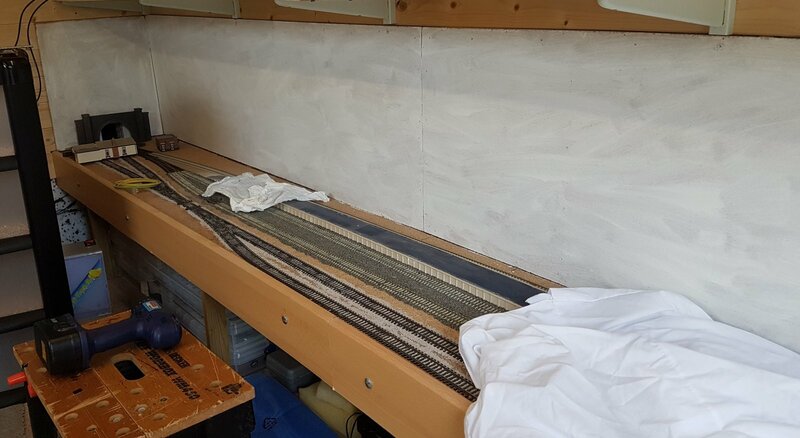 I wasn't expecting such an overpowering odour from the paint but with the shed door wide open I persevered and managed to get a coat on but without going right up to the edges. There are gaps between the backscene boards that need filling too but I just wanted to try give myself a better idea of what I can and need to do. The lighter coloured backscenes add framing to the area making it easier to visualise the possibilities. I don't think it will hurt to do another coat of undercoat . 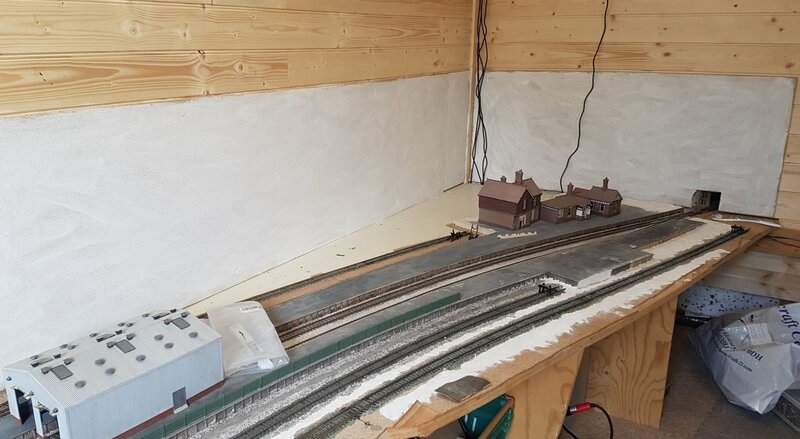 I had every intention of going into the shed today to make some progress with the indoor scenery but it was such a lovely day that I decided instead to clean the track and see if I could get some trains running. It had after all been some time since any last ran. Once I'd been round with the track rubber and cleaned the rail tops I cut back some overgrown lineside vegetation and then set about cleaning up a mass of bird droppings, mainly along Stack Gill viaduct as it's where the birds like to perch. I had to use an old toothbrush to dislodge the droppings from amongst the sleepers and ballast before hoovering it all away. I then sent out trusty old 26024 with the track cleaner and IPA solution and it circled the layout without any problem. With the track nice and clean I ran a class 158 2-car DMU and then decided it was time for some blue/grey mark 1 coaches behind a large logo class 37. I chose 37401 'Mary Queen of Scots' as it's never been out before. The MK1's were just the first few I could lay my hands on and not a set I will likely use in the future but blue/grey MK1 coaches behind large logo class 37s just look so good. Here's the class 158 DMU crossing the river Buttle which remains dry at this time but will hopefully show some sign of water in due course. 37401 Mary Queen of Scots is seen crossing the span between Buttlebank and Stack Gill viaduct with its rake of MK1 coaches. This span section requires some central supports to cure the slight bow in the middle which is noticeable to me. The trackbed here is comprised of 2 layers of 18mm exterior grade plywood so it's pretty substantial. After crossing the span, 37401 makes its way along Stack Gill viaduct. I really like the look of the arches in this view but still feel that the parapet walls are a bit too high. I'd like to be able to see just a bit more of the train. And lastly one of my favourite sections of the layout for obtaining realistic lineside views. There's very little distraction in the background and you'd hardly notice that the tunnel portal was in fact stuck onto the side of a path. The old pieces of timber, miniature foliage, rocks, and the plethora of cabling just looks so right. It would be a shame to alter any of this but very soon I'm going to have to relay this area. 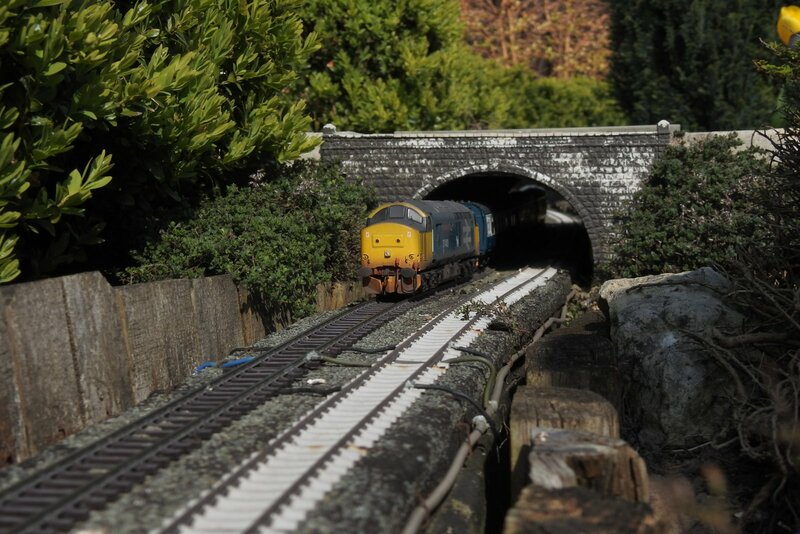 37401 and MK1 coaches again passing through Watch House tunnel. In addition to the photos I've also taken a few videos which I'll try to add later. Tomorrow I really must try to do some work on the indoor scenery. You are absolutely correct about the height of the walls on the viaducts. They are too high. Now what's the easiest way to reduce them? Dremel? Old fashioned bread knife? Hacksaw blade? Sandpaper! - they sand down easily Roddy. Creates a bit of dust but it will soon vacuum up. Now on my to do list. Thanks Andrew. Yes, the viaduct's pretty long which is more apparent when you see a small DMU crossing. One day I'm going to put a full trainload of 100t coal hoppers across just because I want to see it! Until the layout is more complete there never seems to be a chance to sit back and enjoy it to the full. I have to mess around changing stock, getting things out of boxes and so on and it become a chore rather than a pleasure with empty boxes and other junk around the place. One day it will come. An awe-inspiring video, as well as the still shots. 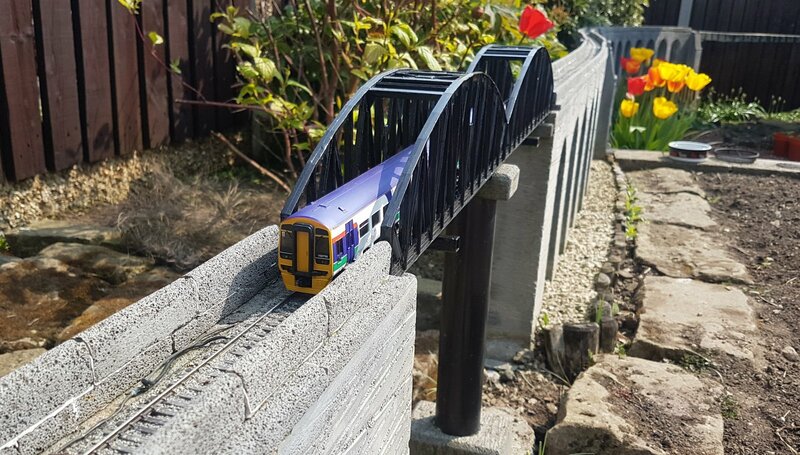 It shows just how good a OO garden railway can be. I'm not too sure about the height of the walls on the viaduct. I don't think they should be lowered enough for an unfortunate 1:76 p/way man to accidentally topple over. It is nice to see as much of the trains as possible but please don't lower the walls too much. Perhaps I'd better take a closer look. It seems some sections of the wall are higher in places than others. The photo of the class 158 above makes the walls look too high and if you imagine a 1/76th scale man stood in the cess alongside he'd need a ladder to be able to see over the top. But it's not a priority at the moment so it gives me time to think. 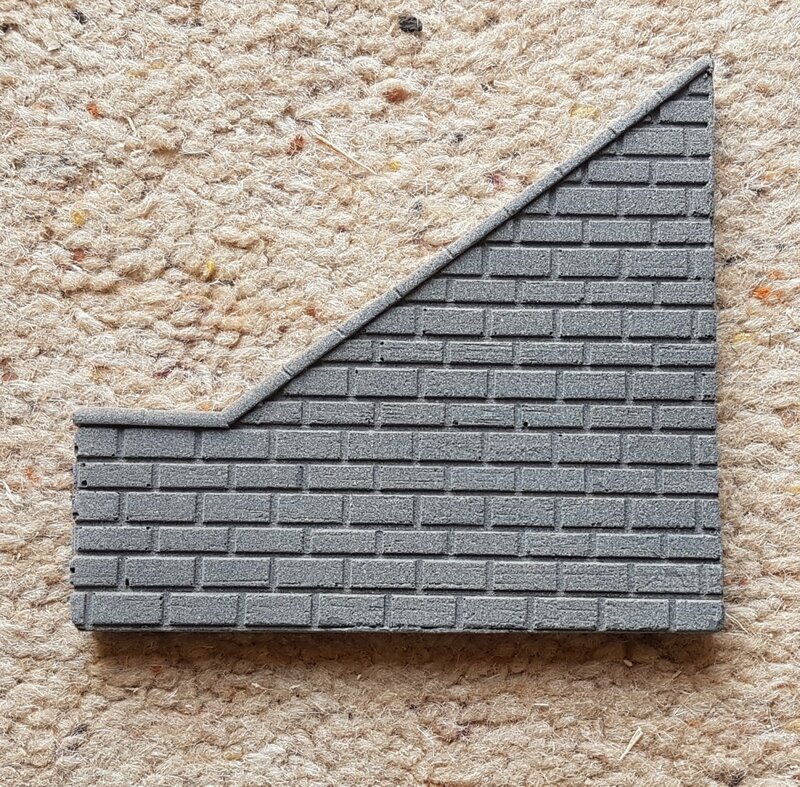 Right, I've made a start on the indoor scenery - brace yourselves! 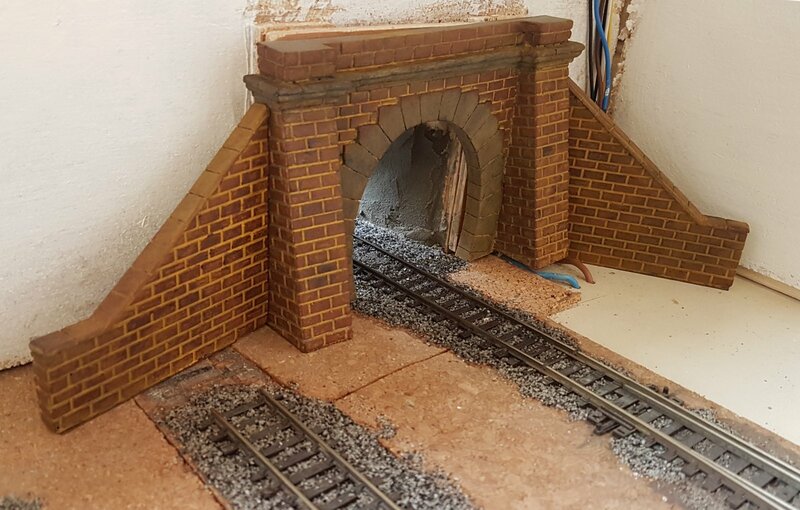 Before I can do too much I need to fix the entrance tunnel portals in position, but before I can do that they really need painting otherwise they'd be less accessible. Here's where I start - with a blank section. It's going to be trial and error but I've seen it done this way before. Not too sure about the yellow colour - perhaps it's too yellow? but I paint the whole section aiming to get paint into the cement lines. And then once it's dried I use a mix of red, brown, and black, taking a little of each on the tip of my brush, wiping on a paper towel to remove excess paint and then dry brushing across the face of the bricks. Here's my first attempt. The tunnel itself was similarly treated with the yellow paint. And finally after going over the pieces until I was satisfied they looked okay, here's what I am left with as the pieces are placed in the location they will eventually take up. 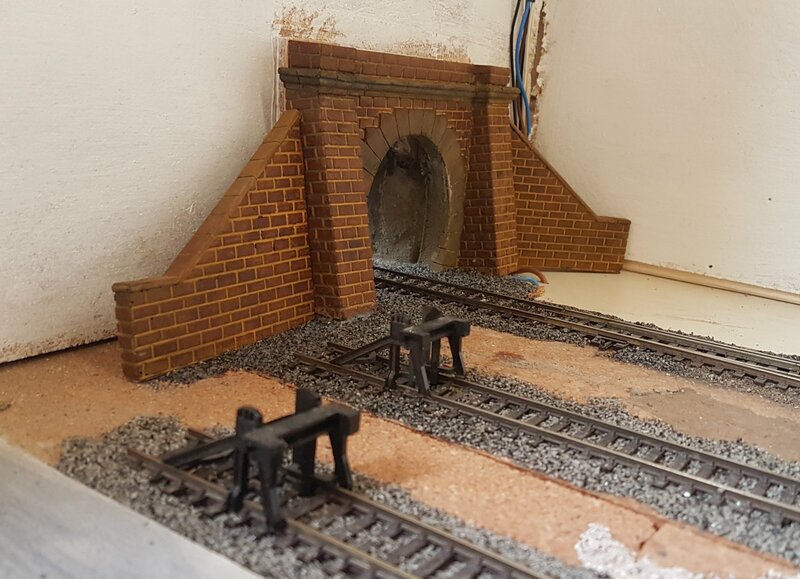 I will tidy up the inner walls of the tunnel when it's finally stuck in place. I've used acrylic paint so I need to varnish before they're glued and then perhaps with this out of the way I can start moving forward. 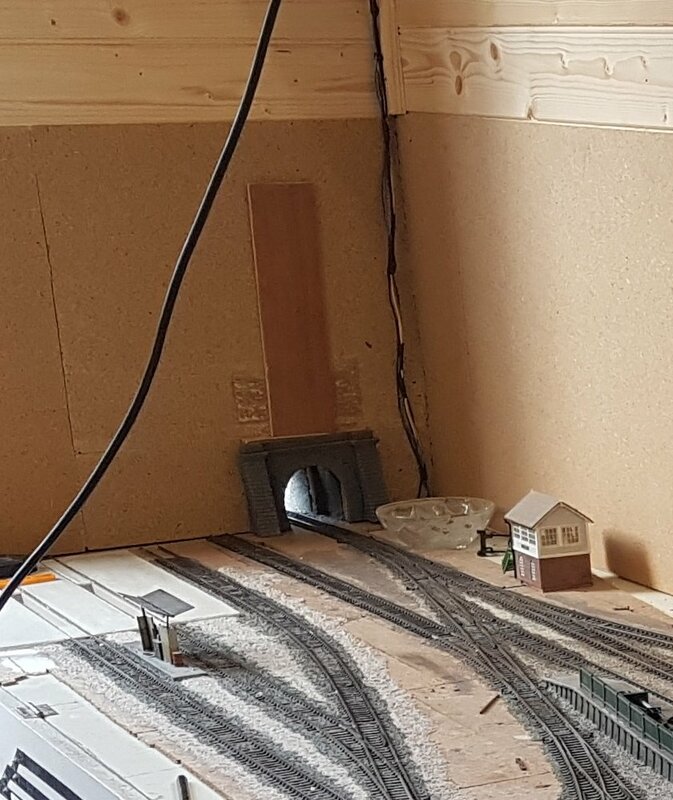 I mentioned about tidying up the inside of the entrance tunnel wall after I'd fixed the tunnel portal in place but what I hadn't considered was the fact that I've altered the opening to include a plywood slide in order to close off the opening when the layout isn't in use. This earlier photo shows the plywood sliding gate in its raised position - it can slide down to close the tunnel entrance. 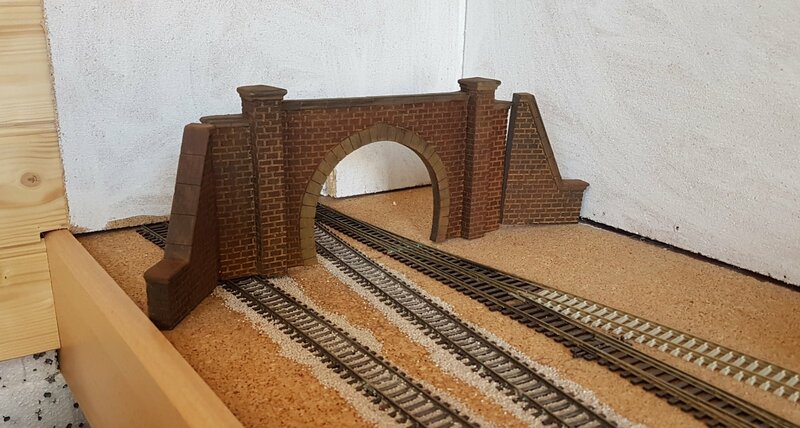 I fixed the tunnel portal in place, mixed up some filler for the tunnel inner wall but then found I needed a clear slot for the gate to slide up and down. Oh well, back to the drawing board! You can see the groove that the plywood slide made in the photo below. Doesn't look too bad I don't suppose, in fact I wouldn't bet against there being similar indentations in some real tunnels. I've been sitting outdoors in the sunshine this morning painting the remaining tunnel portals. It will be great to get all three fixed permanently in position but a temporary mock-up for the sake of a photograph will have to suffice for now. The far end of Shieling Bridge station isn't a problem. 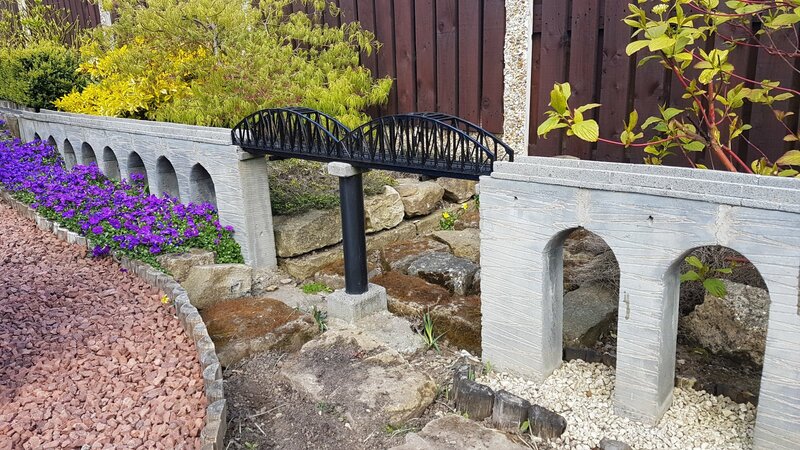 The bridge needs to be aligned at a slight angle to be at right angles to the running line and the platform end needs sorting in order to allow it to fit. The inner walls of the tunnel will also require some work but it's nothing major. 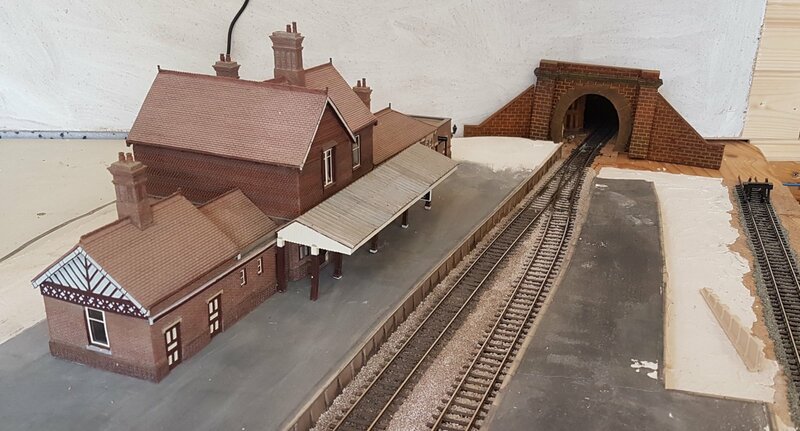 The terminus station at Cattle Leys was the difficult one of the three as the track layout where the tunnel needs to go is too wide for a single tunnel portal and will require a set of points to be housed inside the tunnel in order to use a double track portal. Prior planning would have made things a lot easier! I can perhaps move the portal back slightly towards the end wall backscene but either way I will have to cut a the headshunt shorter by a few inches. 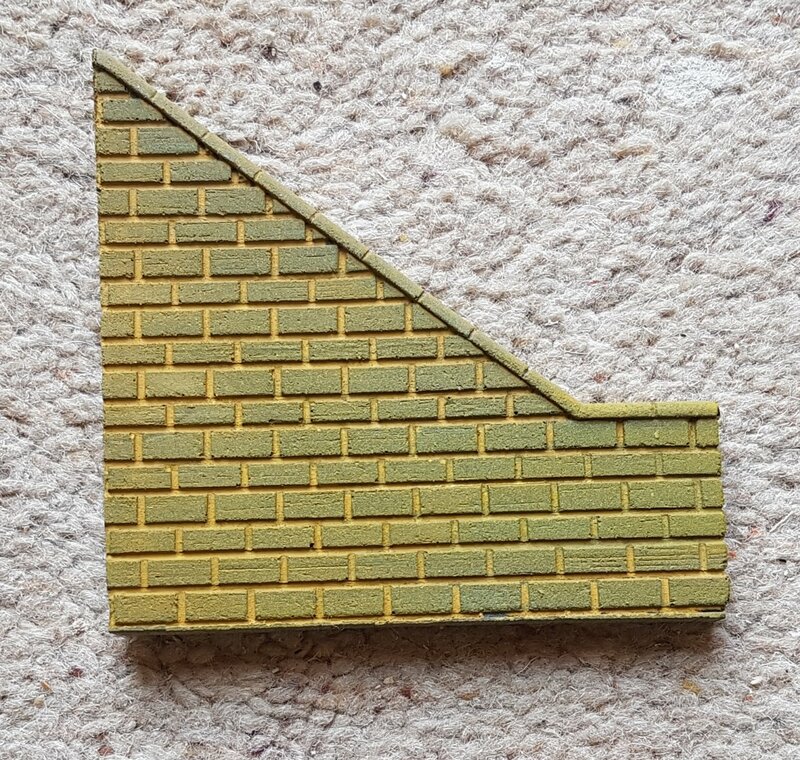 I think the point inside the tunnel will be okay so long as nothing ever goes wrong with it but it is accessible without too much trouble should anything ever happen as it's really only the tie-bar end that's hidden and there's the possibility of gaining access from the outside. 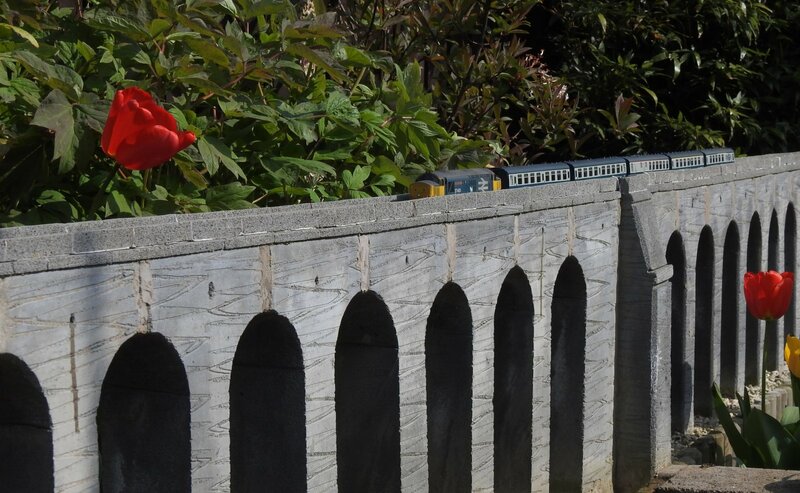 Today has been one of those days that's perfect for a garden railway. You forget all about those dull, damp winter days and start bringing your overwintered loco's out into the open. I have two HST's available, the blue/grey one featured regularly on my previous layout, but this InterCity version has to date not been on track. 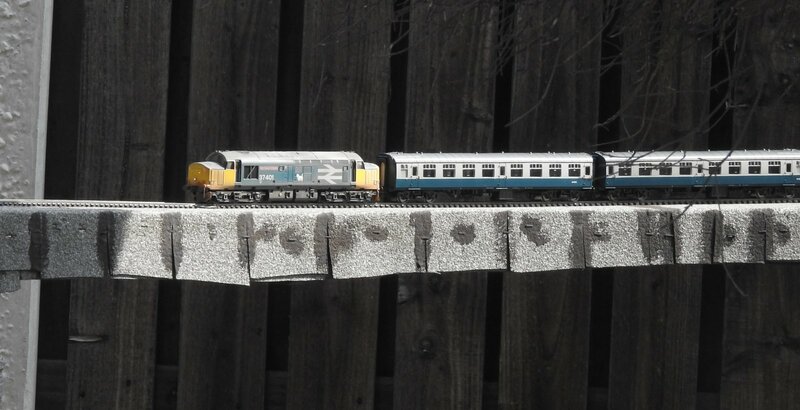 I know they don't fit in with either of the scenarios my layout is supposed to portray but there are times when you just need a good roar and there's nothing better than the sound of an HST or Deltic pulling away from a standing start. Hornby are soon to release the HST in the latest Scotrail 'Inter7City' livery along with matching sliding door MK3 coaches so hopefully we'll see one of those examples on Worsley Dale in the near future. 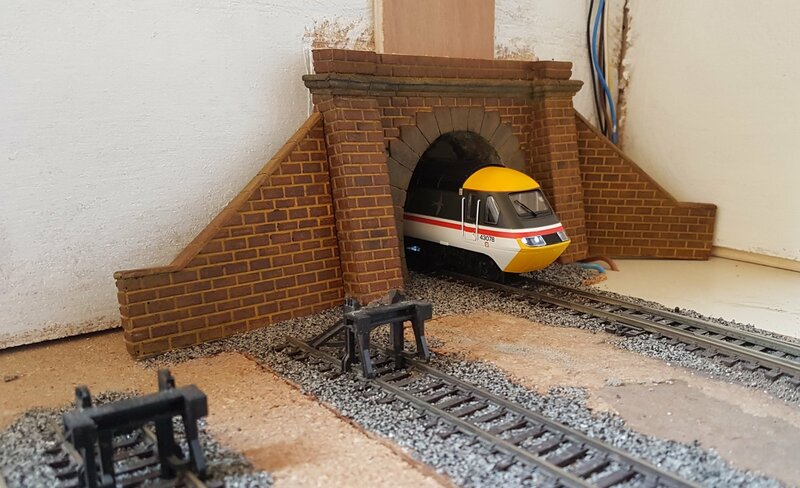 Hi Mick, wow, have to agree with bai4eagle, especial the HST train coming out of the tunnel, pure awesome, you station is coming along nicely, look even better with another train waiting on the side loop, are you going to have signals. Somehow there comes the desire to have an HST.